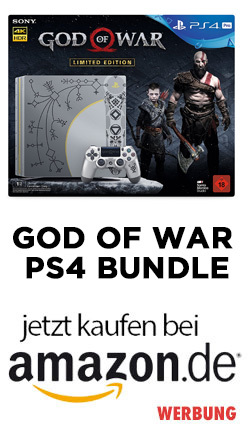 Kurz nach dem Verkaufsstart der PlayStation 4 gab es einige Meldungen zu überhitzenden Konsolen. Wie wir heute wissen, handelte es sich bei den damaligen Meldungen nur um recht vereinzelte Fälle. Ein Grund dafür dürfte die durchdachte Kühlung der Konsole sein. 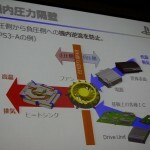 Aktuell präsentierte Sony’s Engineering Director Yashuhiro Ootori während der diesjährigen INTERNEPCON in Japan die Kühlung der PlayStation 4 Im nachfolgenden Beitrag findet Ihr einige Infos sowie Screenshots direkt aus der Präsentation. 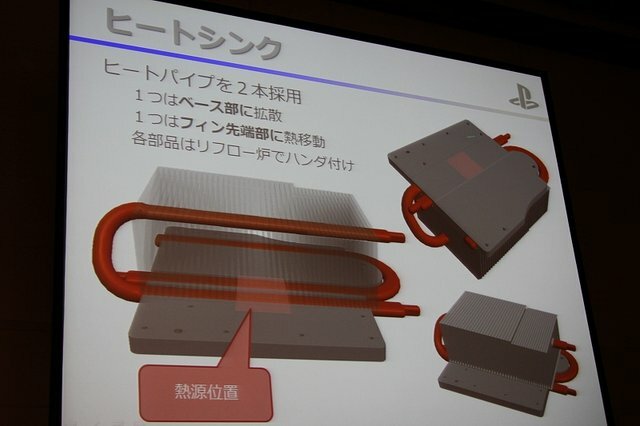 • The cooling solution of the PS4 follows a mix of the basic designs of version G and N of the PS3 (the second and third iterations). 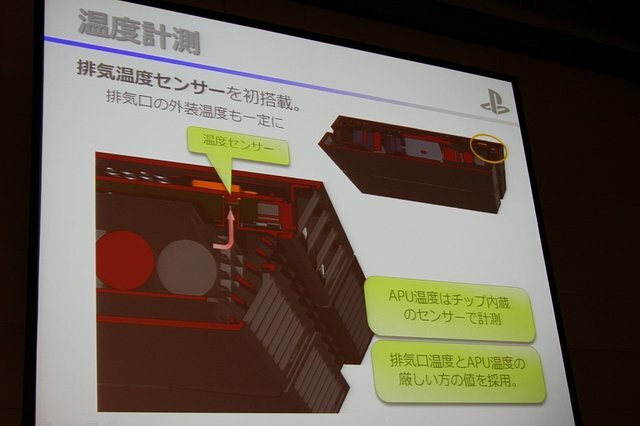 • The airflow design of the PS4 is based on the PS3 version N, while the power supply, heat sink and cooling fan derive from the know-how gathered while building version G.
• Air coming from the intake port is split in two and used to cool both the bottom and the top of the main board, then flows into the heat sink, cools the internal power source and then is expelled through the exhaust port. • The airflow is regulated and channeled thanks to the difference between areas of positive pressure and negative pressure generated by the cooling fan. • The design of the heat sink is simple, with two heat pipes. 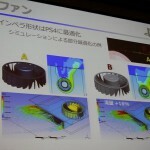 The pitch of the fins has been improved by giving it a different angle in the low speed area compared to where the air flows faster, and the design of the blades has been optimized for the PS4. • The fan has been given a trapezoidal shape when seen from the side: during experimental testing the engineering team determined that this peculiar shape reduces the noise generated by turbulence. • The motor that propels the fan is a three-phase one. 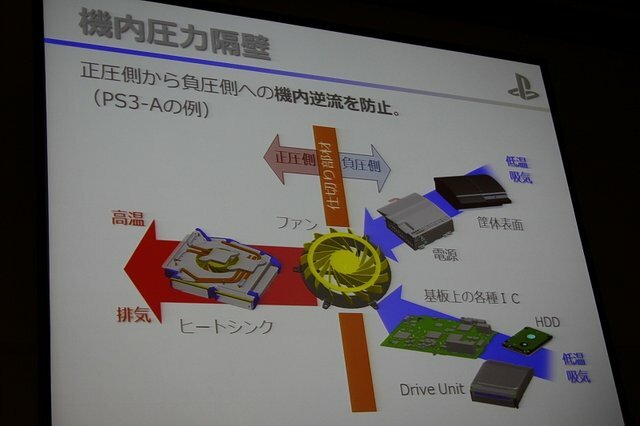 It’s slightly more costly than the single-phase motors used in the PS2 and PS3, but allows for lower power consumption and less vibration at lower rotational speeds. 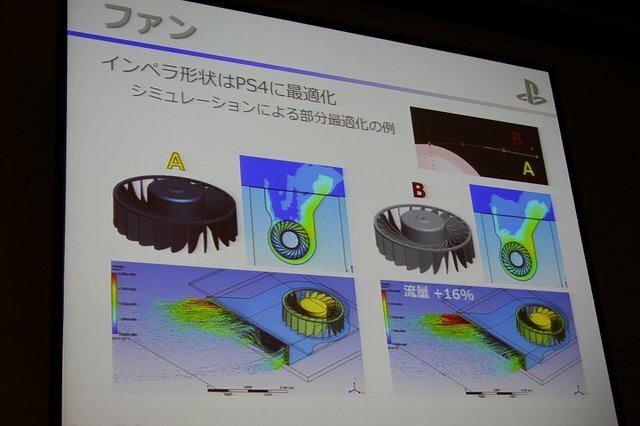 • Since in video games graphical load and heat generation varies very sharply, the PS2 and PS3 had a problem where their fans would not decrease in rotational speed efficiently when load dropped suddenly. This problem doesn’t appear in the PS4, reducing the overall noise. 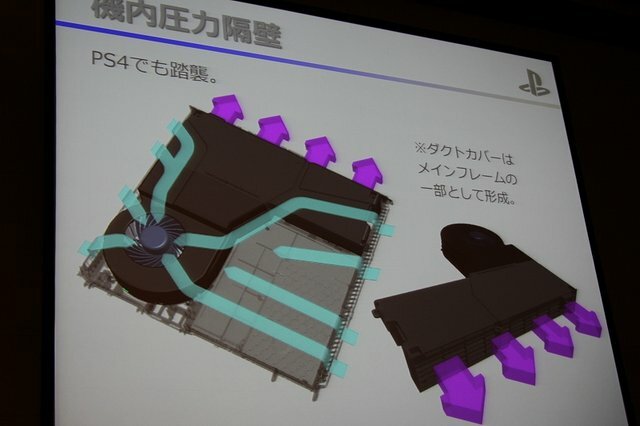 • The PS4 has a sensor that measures the temperature of the air passing through the exhaust area. Thanks to that, it’s possible to control the surface temperature of the shell. 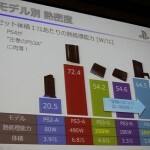 A comparison between the efficiency of the cooling solution of the PS4 with the three PS3 models and the PS2 was also made. 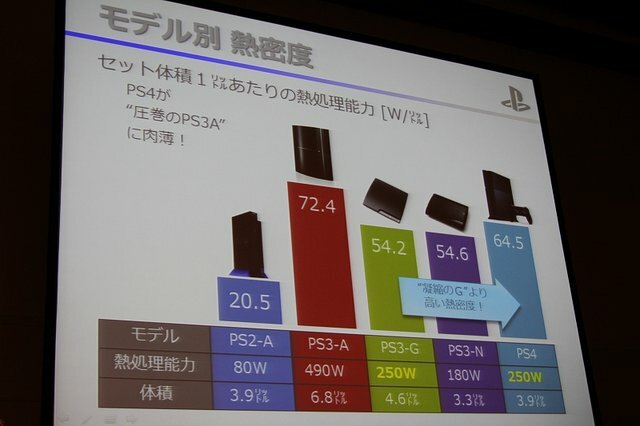 • The PS4 has a heat treatment capacity compared to the volume of the unit similar (slightly lower) to the first PS3 model despite being much smaller. 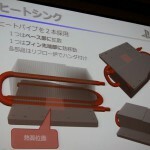 • The airflow is considerably more powerful than that of the G version of the PS3 and similar to that of the N version. 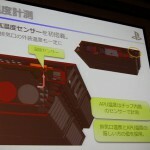 • The area of the intake and exhaust ports is quite a lot lower than the first PS3 that was “full of holes,” but higher than the other two models, while keeping a natural design. 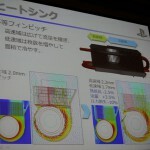 • During gameplay the noise level is comparable to the latest model of the PS3, despite the much higher graphical load. On the dashboard noise is much inferior thanks to the three-phase motor of the fan. 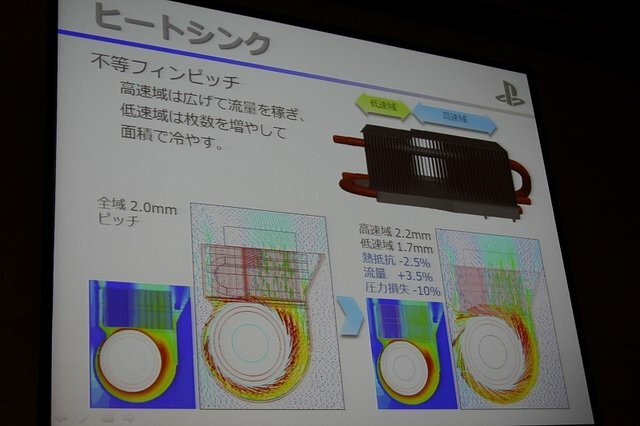 • The PS4 beats the earlier models of the PS3 (but not the latest one) for heat treatment capability per dollar cost, being able to dissipate the heat generated by 5.1 W per dollar.